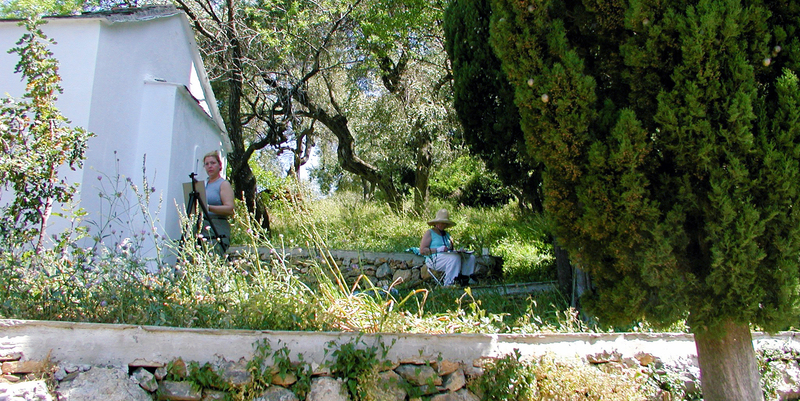 Join Kat O’Connor Master painter and instructor on her fourth painting trip to the beautiful Greek island of Skopelos! This two week workshop offers you the opportunity to engage in the creative process in an environment of spectacular natural beauty and dazzling color. Once on the island, you’ll paint among olive groves, along the shores of the Aegean, and in the quiet sanctuary of a monastery. A day will be spent at the fabulous chapel of Agios Yiannis, the setting for Sophie’s wedding in the hit film Mamma Mia! Instruction will focus on gaining confidence in painting and drawing on-site. Mornings will be spent learning how to develop strong compositional studies, preparatory sketches, and color studies as a reference for completing works en plein air and in the studio. Afternoons are free to explore the island or develop your own work. We’ll meet again in the early evening for critiques or cultural workshops. Work in your favorite mediums – watercolors, pastels, oil paints (traditional or water-soluble), acrylics, or colored pencils – and come with a basic understanding of that medium. If you can pack it, you can use it! Course instruction will include on-site classes, one-on-one time with Kat, and group critiques. A special series of Cultural presentations will introduce you to Greek history, culture, and an evening of Greek dancing and traditional music. Our class begins in Athens with an exciting 2 day field trip, highlighted by tours of the ancient Acropolis the magnificent new Acropolis Museum. We’ll dine in lively tavernas and explore the quaint streets of this legendary city. The class concludes in Athens with a visit to the National Archeological Museum which houses the world’s finest collection of ancient Greek Art . Join us for the art/travel opportunity of a lifetime! Note: Most painting is done out-of-doors and requires moderate walking and carrying abilities. Fee includes tuition, double occupancy accommodations in Athens and Skopelos (an additional fee of $545 provides single occupancy), cultural workshops, land and sea travel in Greece, including Athens/Skopelos/Athens, field trips and museum admissions; does not include airfare and most meals. Spouse/Non-students are excluded from studio classes but may enjoy all other facets of the program including field trips, archaeological site and museum visits, cultural workshops and social activities.